YEOVIL have voiced their wariness of Pompey’s individual threat. And Glovers boss Darren Way has warned his side they need to watch out for the Blues’ counter-attacking quality at Huish Park tomorrow. Paul Cook’s men take on Yeovil with confidence boosted by the victory over Bristol Rovers last weekend. 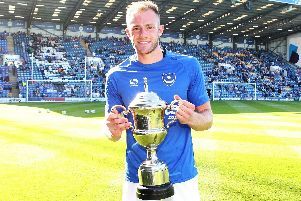 Michael Smith opened his Pompey goal account, while Gary Roberts’ form was highlighted as a big factor in the win. Way pinpointed both players as typical of the quality Cook can call upon. The hosts go into the game off the back of defeat against Hartlepool last weekend and are one off the bottom of the table. But Way has lifted the Glovers since succeeding Paul Sturrock in December. They are unbeaten in six games on their patch – a run stretching back to November – and had won two and drawn their previous games before they slipped up at the Victoria Ground. Pompey have shown on a number of occasions how they can hurt teams breaking quickly and exposing gaps. Way has noted that and underlined it’s something he will be paying attention to going into a big game for both sides. He said: ‘Pompey play a counter-attacking game and have got some very good players in one-v-one situations. ‘They’re a threat, they really are. Michael Smith has been in League One and is an experienced player who can score goals. ‘Gary Roberts has had a very good career and gets paid good money because of that.